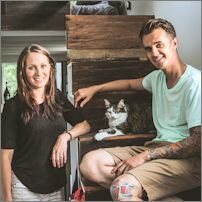 Trevor Gay & Mary Benasutti live in Dayton, Ohio with 4 furry felines. They built their “Heart Of It All” tiny house together with the help of family & friends in 2015 and are living happier ever since. The charming couple are animal experts and enjoy spending time outdoors as much as possible. You can follow their story and adventures at Heart of it All House.